A simple white votive 2"x 2" frosted glass candle holder will fit in with all of your guests' decor. It is the perfect 1st Communion favor. Each candle holder has a poured white votive candle inside. 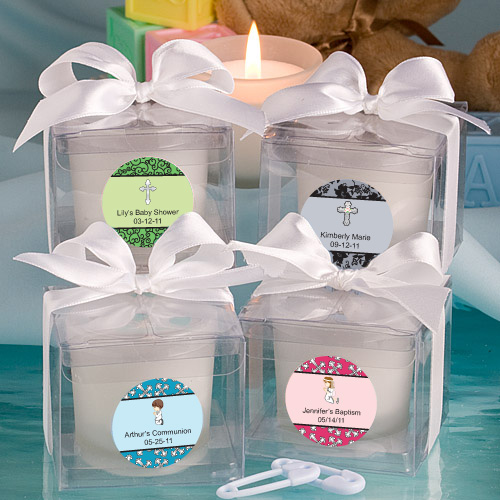 Completely assembled, each candle comes in a 2 1/2" x 2 1/2" clear acetate box, wrapped and tied with a white satin bow. A set of personalized stickers of your choice come in a sheet for you to affix to the box. Personalized labels needs to be affixed to the candles by you.